In addition to smoke detectors, it is now typical to have carbon monoxide detectors in homes. In fact, in some states, they are legally required to keep people safe from carbon monoxide poisoning. Carbon monoxide is an invisible, odorless gas that is produced by many household engines, such as generators, furnaces, and water heaters. Since it's impossible to recognize that there is a carbon monoxide leak without a detector, many people get sick from carbon monoxide poison before they know the leak exists. Even after people get sick, it may be hard to determine the cause of the illness without a detector. Why Is My Smoke Alarm Beeping? Severe poisoning can result in symptoms like loss of coordination, vomiting, confusion, and even death. According to the National Fire Protection Association, in 2010 alone, fire departments in the United States responded to about 80,100 carbon monoxide alarms (an average of nine per hour). This number is a significant increase from the 40,900 such calls in 2003, and the surge is probably due to increased use of carbon monoxide detectors. Code One Battery Operated Carbon Monoxide Alarm - This alarm is economical at only about $20. The alarm has a loud a horn sound that you will be sure to hear in an emergency. It can either be mounted on the wall or placed on a piece of furniture. Kidde Worry Free 10-Year Lithium Ion Battery Operated CO Alarm - There's no need to worry about a battery running out with this 10-year lithium battery-powered detector. This detector's gas sensor lasts about 40% longer than other detectors, which often have a lifespan of about five years. It costs bout $40. Kidde Plug-In Carbon Monoxide Alarm with Digital Display and 9-Volt Backup - While most alarms sound when there are over 30 parts per million of carbon monoxide in the air, you usually can't tell exactly what the measurement is. This alarm has a digital display that lets you know exactly what the carbon monoxide PPM are between 30 and 999. It plugs into an outlet, but it has a battery backup in case you lose power. Customers report that it lasts about seven years. It is priced around $45. First Alert DC Plug-In Carbon Monoxide Detector with Battery Back-Up - This detector plugs into any outlet but has the reassurance of a battery backup. The digital display tells you the exact level of carbon monoxide when the alarm goes off. This alarm has a seven-year lifespan and retails for around $40. Nest Protect AC Hardwired Combination Smoke and Carbon Monoxide Detector with Photoelectriv Sensor and Battery Back-Up - This high-tech alarm messages your phone when the alarm goes off in case you're not home. It also messages your phone if the back-up battery needs to be replaced. You can also turn the alarm off using your phone. Additionally, since it's a joint smoke and carbon monoxide alarm, when it goes off, the alarm says what the issue is so that you know how to respond. This alarm is priced just under $100. 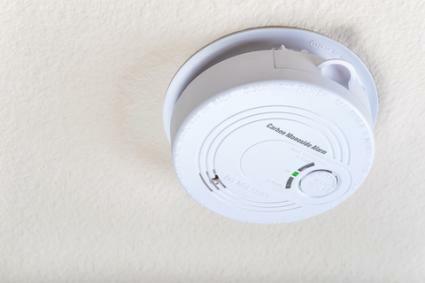 No matter which type of carbon monoxide detector you use, you want to make sure it's working properly. To do so, the Consumer Product Safety Commission recommends that you replace the batteries in your alarm each year (if you have a battery-operated alarm). You should also do a monthly test on your alarm using the test button to check that the alarm is working properly. Additionally, pay attention to the alarm's stated lifespan, which can vary with each model, and replace the alarm when necessary. The CPSC estimates that there are 170 deaths per year in the United States from non-automotive carbon monoxide poisoning, and the National Conference of State Legislatures (NCSL) states that there are over 500 carbon monoxide poisoning deaths total in the United States each year. The NCSL also reports that each year more than 10,000 people need medical treatment for carbon monoxide poisoning. With the use of carbon monoxide detectors in your home, you can protect your family from being part of those statistics.